Winner of three book awards, Chicago River Bridges presents the untold history and development of these fantastic engineering and architectural marvels spanning the Chicago River today. It is the story of Chicago as seen through its bridges. Bridges, both past and present, have proved critical in connecting and reconnecting the people, industry, and neighborhoods of a city constantly on the make. 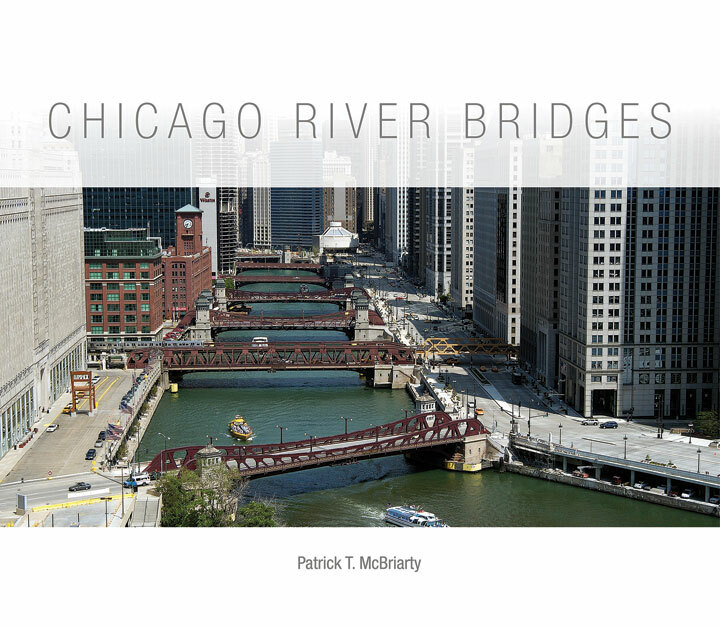 In this book, author Patrick T. McBriarty shows how generations of Chicagoans built (and rebuilt) the thriving city trisected by the Chicago River and linked by its many crossings. This first comprehensive guidebook on Chicago’s bridges offers a broad contextual look at these key links of the city’s urban landscape and fantastic detail. Chicago River Bridges chronicles more than 170 bridges over time spanning 55 locations along the Main Channel, South Branch, and North Branch of the Chicago River. With new full-color photography of existing bridges by Kevin Keeley and Laura Banick, cover image by David Solzman Ph.D., and additional historic maps, diagrams, and photographs to deliver approximately 200 images to reveal the rich history of Chicago’s bridges. From the iconic Michigan Avenue Bridge to the often forgotten Rush, Erie, Taylor, and Polk Street bridges this book is chock full of fascinating stories and remarkable detail. Throughout, McBriarty delivers new research into the bridges’ architectural designs, engineering innovations, and their impact on Chicagoans’ daily lives. Describing the structure and mechanics of various kinds of moveable bridge designs (including vertical-lift, Scherzer rolling lift, and Strauss heel trunnion mechanisms) in a manner that is accessible and still satisfying to the bridge aficionado, he explains how the dominance of the “Chicago-style” bascule drawbridge influenced the style and mechanics of bridges worldwide. Interspersed throughout are the human dramas that played out on and around the bridges, like the floods of 1849, 1857, and 1992, the cattle crossing collapse of the Rush Street Bridge in 1863, or Vincent “The Schemer” Drucci’s Michigan Avenue Bridge jump in 1922. This book is available at most downtown Chicago museum gift shops, Chicago area booksellers, Amazon, and Barnes & Noble dot com. Pick up a copy today!